When I think about my winter in Italy, I think of cobblestone alleyways sparkling with rain, mist-shrouded cathedrals in the “hill country,” days spent with tourist attractions almost all to myself, and a pleasant chill in the air—cool, but not too cold. 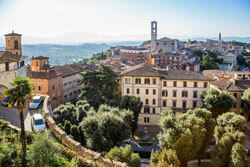 I based myself, during my five winter weeks in Italy, in the mid-sized university town of Perugia, which is the capital of Umbria, Tuscany’s lesser known but just-as-lovely neighbor. It’s a place of rolling hills, world-famous wines and postcard-perfect mountain towns. Because Umbria is nestled in between Tuscany (where you will, of course, find pretty, popular Florence, as well as a sunflower-dotted countryside that has inspired writers, artists, and tourists alike) and Lazio (the region that houses historic, grandiose Rome), it was the perfect place to do a little exploring. And so I found myself, in the middle of the mild Italian winter, exploring the regions around me, untroubled by lines or crowds, and delighted by the ease of getting around even without a car. I spent a day in Florence, drinking rich Italian coffee and wandering around the almost deserted cathedral. Then, I visited Assisi—the birthplace of the famous, cheerful, nature-loving St. Francis—where Romanesque architecture, pretty white-stone buildings, and an easy hike down the hill to a hidden-away nunnery charmed me completely. After that, there was Rome, where I scheduled a food tour and learned to tell the difference between mozzarella and buffalo mozzarella, how to make Roman-style pizza, and where to find the best bread in the city. I left with a bag full of brightly colored liquors, a thick truffle-infused vinegar, and some locally pressed olive oil from the Campo dei Fiori market, and spent the next several days trying them with different foods in different combinations. And so I enlisted a new Italian friend with a car and we drove across the quiet, pretty countryside, up the hill to the imposing, walled old-town, where we spent a day drinking in the views, exploring the shops, and, of course, tasting the local fare before returning to our homes in Perugia. When I think back on my time in Umbria, one of the things that strikes me most was how easy it was to explore so many different places…to experience so many different things. Rome was less than two hours by train, Assisi just 30 minutes, and Florence only a little farther. And the trains in Italy were surprisingly cheap. When I left for Paris at the end of my stay, my overnight sleeper car was less than $50. A ticket to nearby Assisi was less than $5. 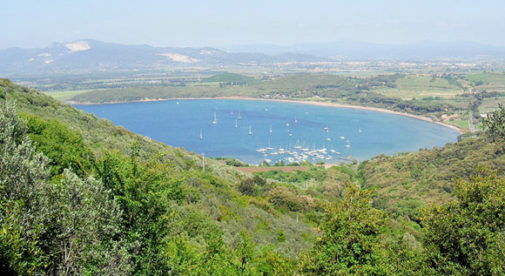 And a quick search reveals that plane tickets from the nearby airports of Rome or Florence can get you to other popular European cities, like Barcelona or Paris, for less than $75 round-trip.